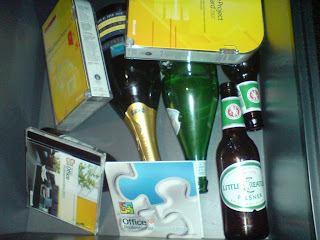 The contents of one of my desk drawers. This says so much about my life. Hey, stop worrying, it's a TIDY drawer (never mind the contents, study the geometry). I've never been that tidy in my life! You should see the others, nothing like that. I must have 2 years of payslips in the one above.